Shopping for Iron Man Bags? This rolling suitcase looks like Iron Man's armor. Features a touch-sensitive light-up arc reactor! Includes zipper closure, zippered inside pockets, a handle, an extendable pull-handle, and more. Now boarding… you and your awesome Marvel Iron Man Molded Hard Light-Up Rolling Suitcase! 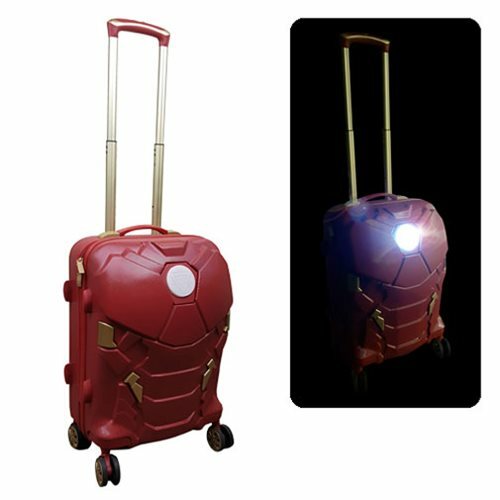 Complete with a touch-sensitive light-up arc reactor, this gold-and-red-colored trolley case is made of polycarbonite and measures about 20-inches tall x 14-inches wide. It looks like Iron Man's armor and features zipper closure, zippered inside pockets, a handle, an extendable pull-handle, and 360-degree movement of the wheels. You can bet Tony Stark has one of these! Requires 2x "AAA" batteries, not included. Ages 15 and up.